Since being redeveloped Southern Cross Station has been full of advertising, and in the case of the next train displays, they are no different. Since the current system was commissioned the rightmost screen in each bank of displays has been dedicated to advertising – something that fits in with the general level of hostility the private station operator has towards commuters. However in early August 2012 something amazing happened, when a new Red Rooster campaign took over the screen. Here is a closer look of said advertisement: down the left hand side it lists trains by their destination, along with platform numbers and time until departure, and a suggested set of Red Rooster menu items to eat in the time you have left. 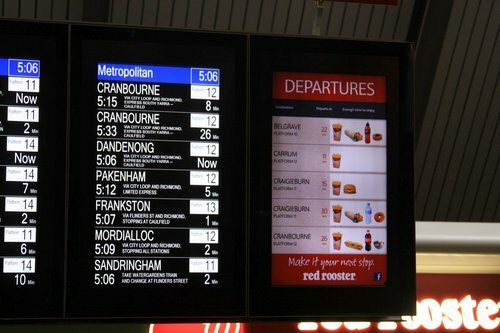 At first I assumed that the new Red Rooster screen was just an advertising gimmick displaying fake data, and would end up just misleading rail travellers. Why would you expect any different from Southern Cross Station! 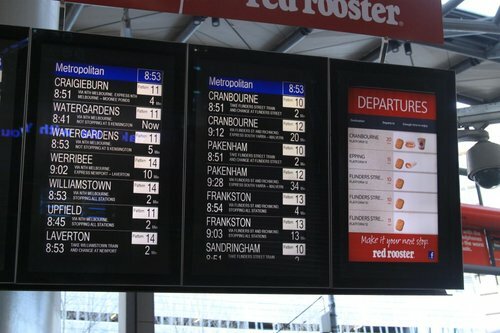 However as I stood watching the screens update every minute or so, I saw a correlation between the ‘real’ information displayed on the existing screens, and the trains listed in the Red Rooster advertisement. Here is one example: a Cranbourne train departing platform 12 in 26 minutes, displayed on both screens. From what I can work out the Red Rooster sign is not displaying the complete feed of real time train data, but is operating on a subset of it – some destinations never appear on the board, and it also ignores trains if the departure time is less than 10 minutes away (presumably that doesn’t leave you enough time to queue up for and scoff down their junk food). 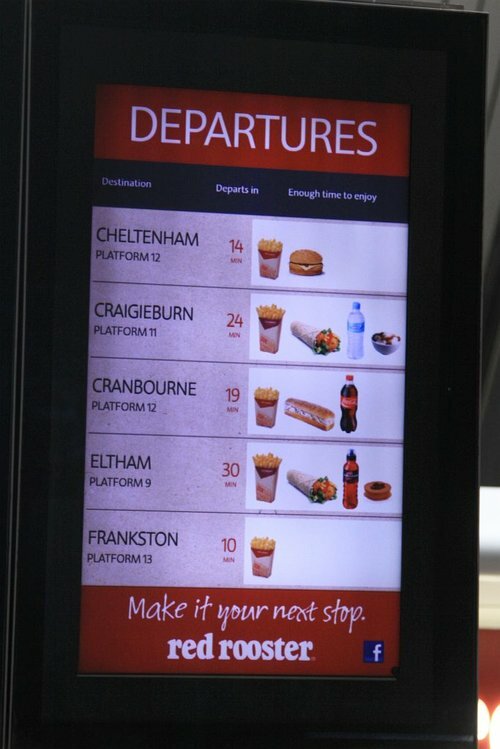 So how did they Red Rooster get a feed of realtime train data to use in their display? I’m going to assume the story starts around 2004, when the redevelopment work at Southern Cross Station started. 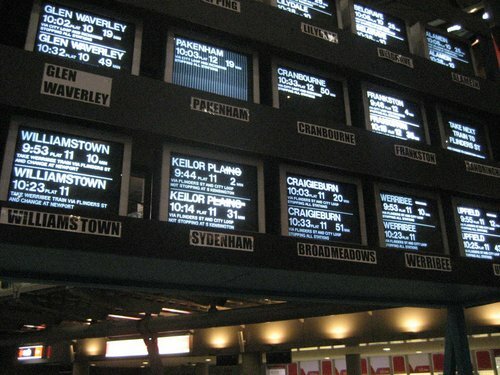 With the removal of the yellow on black text CRT screens, the next train displays on each suburban platform and concourse were replaced by a battery of cheap and nasty CRT screens, which were fed with display data from the previous system via a video converter. Fortunately that bodge job did finally get replaced, when the current PID system was switched on for suburban trains in March 2009. 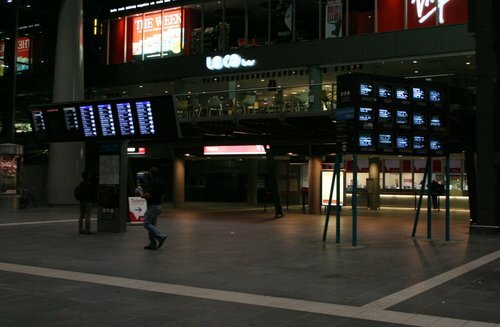 The reason for the delays was never made public, but the rumour doing the rounds at the time was that the main contractor (Honeywell Limited) encountered many difficulties in massaging the data stream from Melbourne’s train control centre into a format they could use with the building management system that ran all of the LCD panels around the station. Whatever their solution was, it is supposedly very clunky, with least three systems involved between retrieving the data and showing it to you on the LCD screens. So the question I have is this: Public Transport Victoria still haven’t gotten around to releasing their timetable data for use in Google Transit and the best their developers can give us is a clunky smartphone app that doesn’t work and relies on static timetable data, so how how has a private company at Southern Cross Station managed to end up with a real time feed of train departure information to use in their advertising signage? I’m going to say money has something to do with it, with a side order of government incompetence. Who is buying advertisements on Metro Trains? “are no different are no different” is possibly not what you meant to say. Also, it would appear that the rightmost, not leftmost, panel is the advertising ? I’m finding it a bit hard to understand why you disliked the system with the 15 CRTs so much. The latest one seems very disorganised and confusing. For example, just take your first photo. These are not listed on the display in timetable order, nor in actual departure order, nor by line, nor by destination, nor by platform. In fact, it would be hard to manually create a more “random” structureless ordering of the information. The main issue with the old system was the fuzziness of the displays: they were running cheap CRTs through a dodgy video converter. The actual layout of the data was much better than what we have now – a regular commuter would know exactly where to look, not needing to look past everything. As a commuter with minor vision problems, can I just say that I think you are wrong about the old crt vs lcd screens. I find the lcd screens impossible to read from a distance – and being visible for a modest distance is the entire purpose of the displays. The new screens are dimmer, harder to read from an angle, and seem to have smaller (and/or less bold) text. They’re rubbish for people without 20/20 vision. I don’t know what you mean when you describe the crt screens as ‘fuzzy’. At least i could apparently read ‘fuzzy’. The lcd screens are also less visible from an angle and less visible through a train window (due to their dullness). This matters when you’re going through Flinders St, where station management are apt to play what one fellow commuter described as “musical trains”, and you could find yourself suddenly on the wrong line, or going back the way you came without going on to the city loop, if you don’t catch a glimpse pf the screens as the train pulls up. While I expect you know, this system of connection with take away food has been used overseas for some time. Is there any train app that gives you real time like Tram Tracker/Hunter? Unfortunately there isn’t a ‘TramTracker’ equivalent for the Melbourne train network – the lack of real time data feed is what is preventing it. The various train apps for smartphones just work from timetable data, so can’t tell you if your train is late. Perhaps the reason there’s no realtime feed of train information, apart from the technical requirements, is that the feed could be used to do an independent analysis of Metro’s delay/cancellations statistics.